If you hold a lot of amazing MTS/M2TS files footages recording the precious moments like birthday party, wedding ceremony, wonderful performance etc, you may probably consider to make them more meaningful and stylish by professional video editing tools like iMovie, Final Cut Pro, Adobe-Premiere, etc. However, in the majority of cases, you may fail to import them. The reason is that such professional video-editing tools often handle footages from DV, MP4, and MOV etc. not give good support for MTS files. To successfully import the MTS/M2TS files, you should convert them to its friendly format first, namely MOV, MP4, or DV format. Compared with MP4, MOV (encoded with inter-frames), DV provides videos with intra-frames, with each frame having being a self-contained picture. Thus it can be easily decoded to an image and easier for editing. 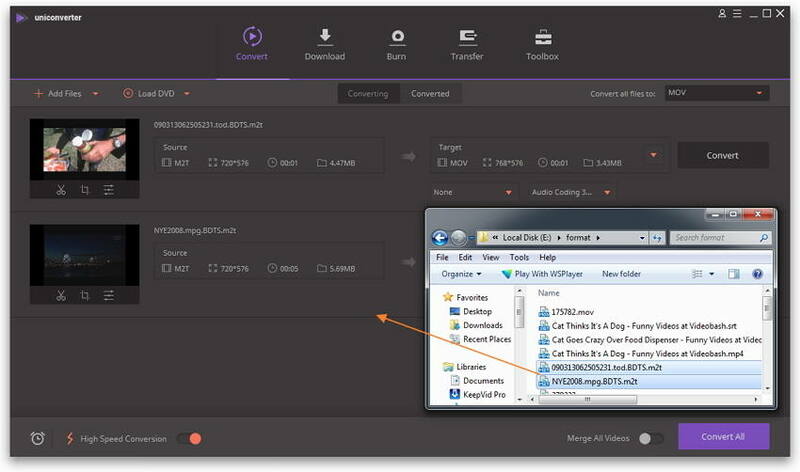 Therefore, converting MTS for editing purpose, DV format is the best choice .This tutorial provides a simple workaround to convert MTS to DV quickly and easily with professional and intuitive Wondershare UniConverter (originally Wondershare Video Converter Ultimate). Please read on to get more details. Note: This MTS to DV converter not only converts MTS to DV, but MP4, MOV and other over 1000 formats as well. What's more, its Mac version supports the latest Mojave OS. Note that both versions function almost the same and this guide takes Windows screenshots for example. Generally, there're 2 options for you to load MTS video to the program. You can either click File > Add Media Files or simply drag and drop your MTS videos to the program. But if your MTS files are on camcorder, you can import them directly from the device. Just plug your camcorder into computer, then run this software, choose the files you want and at last, hit the Add button to import. After all files are imported, you can fix the order, change the output name, and preview them. Click the icon from the Target box and select Video > DV and choose a video resolution in the right. Moreover, you can choose the presets for iMovie and Final Cut Pro from Apple Software, which usually works great and highly compatible. 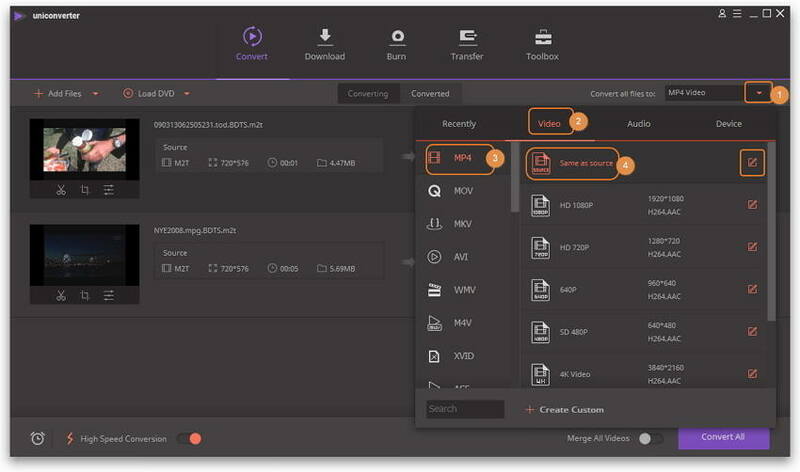 Before MTS to DV conversion, it is optional to customize your videos by trimming unwanted parts, cropping the black edge, merging video clips into one, etc. In short, You can make your video perfect by this way. Once you confirm everything goes as you plan, just click Convert. The progress bar will show you the conversion processing. Then congratulations! 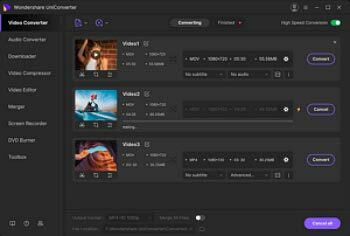 You can import the converted file to iMovie, Final Cut Pro or Adobe Premiere Pro within several seconds. Now enjoy the time with iMovie, Final Cut Pro, etc. to create your masterpiece! 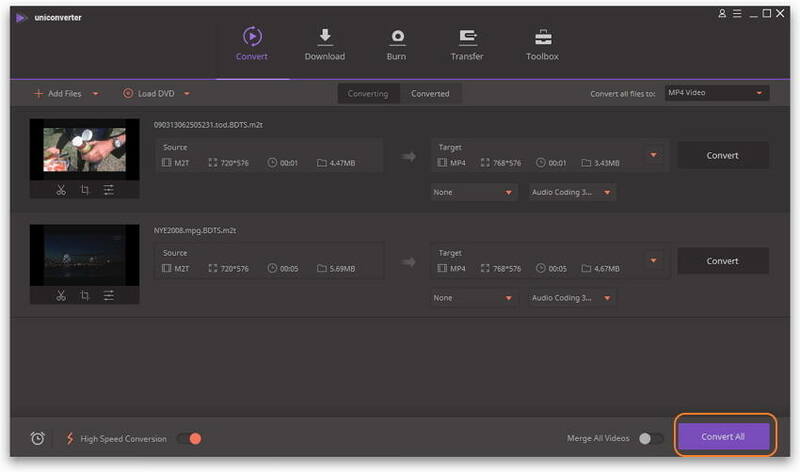 Convert MTS to AVI: Wondershare MTS converter for Mac allows you to convert MTS to any audio/video format or device etc.